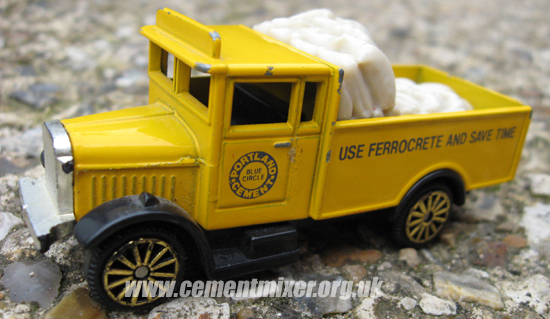 Vintage American pressed steel Structo cement mixer toy from the late 1940's. 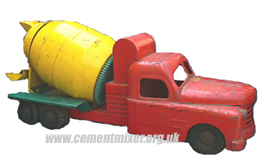 First produced by Lesney as early as 1948, this model is probably the earliest known British cement mixer toy. 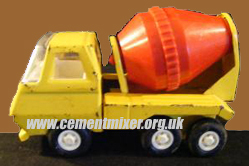 The cement mixer pictured here is a slightly later revised version from 1953 onwards, found also with grey wheels. 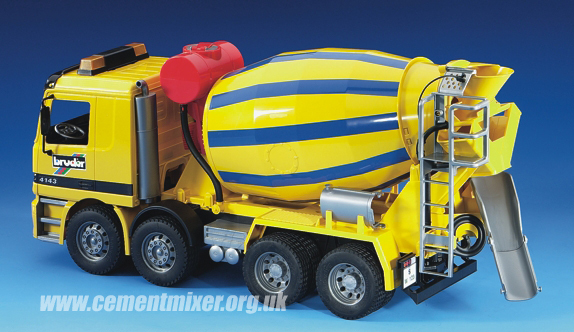 The vintage number 3 portable mini mixer can be wheeled along and has a rotating drum. 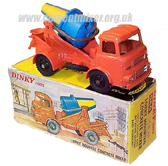 Another of the very first vintage toy mixers is the Dinky Supertoys 960 Albion Lorry Mounted Concrete Mixer, made in England by Meccano Ltd of which there are several different issues, all very rare. In the 1960s and 70s Matchbox produced several die cast model cement mixer toy trucks including the Lesney No 26 ERF Cement Mixer, Matchbox Kingsize K13 Ready Mix Concrete Truck, Superking K6 Cement Mixer & Matchbox Peterbilt Cement Mixer. Some of the early models were reissued using the original moulds. This Matchbox cement mixer from the 1960s featured a push along revolving drum. 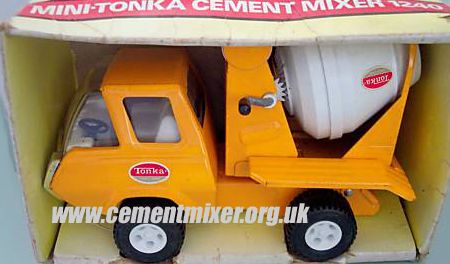 In original box this toy cement mixer is now highly prized by toy and model collectors. 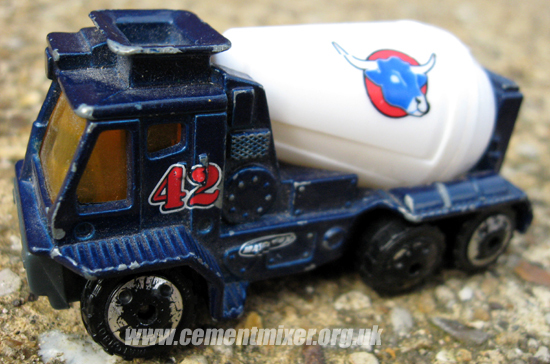 Matchbox Toys Ltd Peterbilt cement mixer released in the early 1980s has a liftable mixing drum. 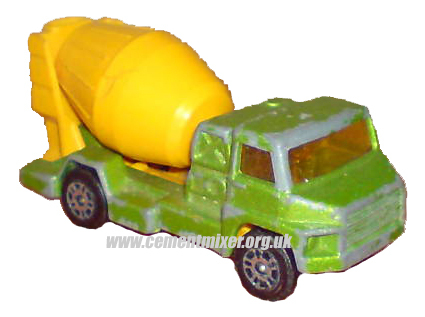 Mattel Inc 2000 Matchbox Mixer Truck with revolving drum. Corgi Juniors toy with revolving drum from the 1970's. 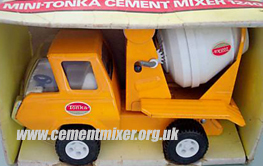 Vintage boxed Mini Tonka 1240 cement mixer with windable handle & pressed steel Tonka toy cement mixer circa 1970. 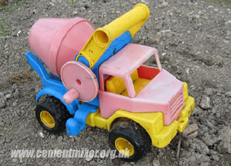 This contemporary Maisto International toy cement mixer features a drum which both revolves and tips. 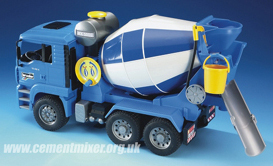 This toy concrete mixer truck from Siku also features a revolving cement drum. 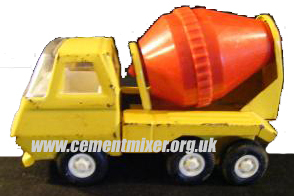 Child's toy cement mixer with push and go friction powered revolving drum. Made in China, manufacturer unknown. Fans of Bob the Builder construction toys know Dizzy as Bob's portable mini cement mixer. Features hand operated drum tipping wheel with ratchet and pull back and go mechanism. 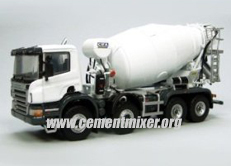 Featuring locking tip up mechanism and hand operated drum mixing. 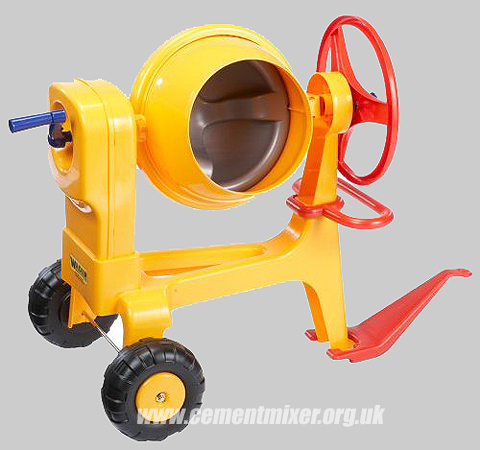 The Wader 'real' mini cement mixer stands over two foot high and is designed for realistic play with turnable mixing handle and tipping wheel. 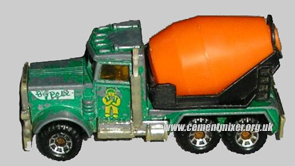 Includes towing hook. 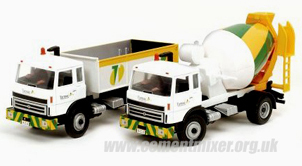 Die cast maker Corgi's artic mixer lorry comes with realistic revolving drum. 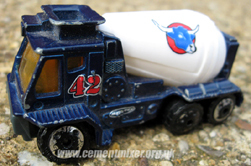 Corgi Blue Circle Portland Cement lorry complete with bags of cement and "Use Ferrocrete and Save Time" decal. Featuring revolving drum, movable chute and tilting cab. 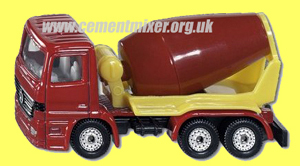 These days specialist German model company Bruder toys are the kings of the toy cement mixer market. 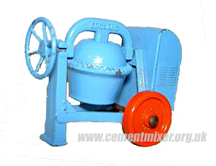 The MAN Cement Mixer has a rotating drum, movable chute and hose which drains water from the water tank which can be collected in the bucket accessory supplied. 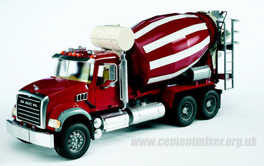 Part of the Pro Series, this version features the Mack Granite cab. 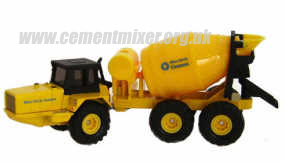 Bruder make a range of accessories such as a snow plough that can be fitted to the front of the mixer. 1:32 Scale Concrete Mixer in the Tarmac livery with revolving mixer drum and working steering. A classic Britains vehicle much favoured by fans and collectors. 1:50 Scale Scania CIFA Cement Mixer replica diecast model in white. 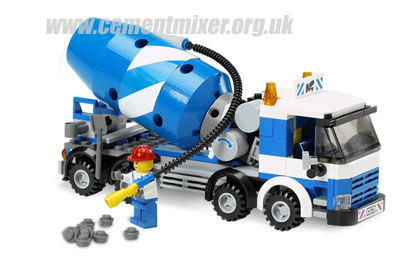 Lego also make the Duplo Cement Mixer aimed at slightly younger fans from 2 to 5 years of age. This Lego toy mixer truck aimed at 5 to 12 year olds features integral concrete pump, revolving cement truck drum and accessories including driver figure. 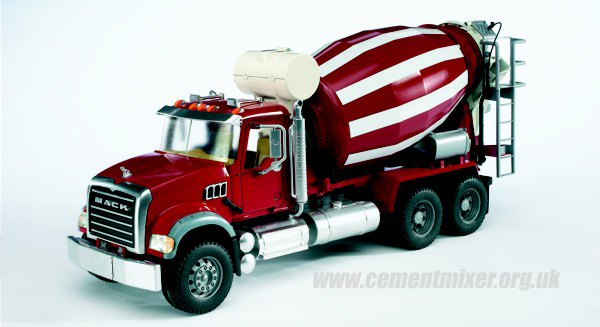 The wonderfully detailed and finished Kenworth toy Cement Truck is made by Hong Kong-based toy company Newray in diecast metal and features opening doors and revolving drum. 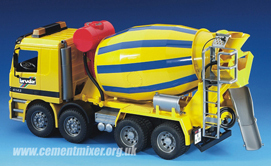 The W900 Kenworth Mixer also comes in black, yellow and blue liveries. 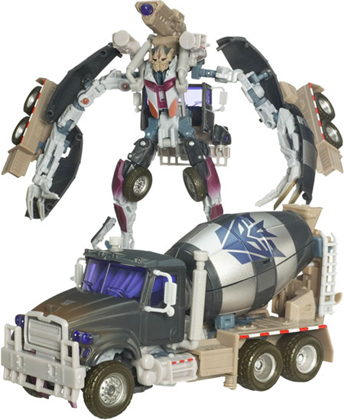 As seen in Transformers the Movie 2 the Mixmaster transforms from an impressively styled cement mixer toy into an incredible alien creature. The toy cement mixer has gone through quite a revolution from its early beginnings as a simple pressed steel toy through to todays detailed scaled plastic injection moulded toys. 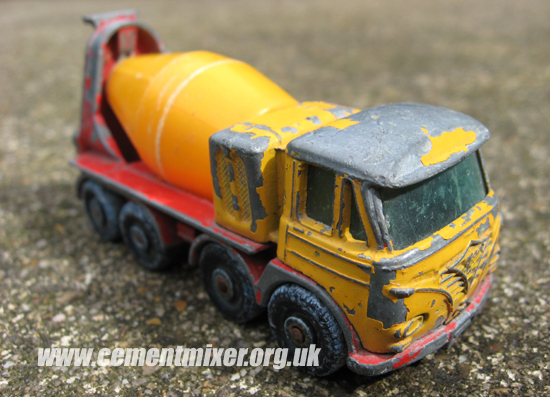 Some of the early Matchbox Lesney Cement Mixers are highly collectable and sell for substantial amounts of money. To fetch the highest prices the toy mixer trucks have to be in mint condition with all paintwork unblemished, moving parts such as the drum undamaged and with the original box or packaging still in good condition. 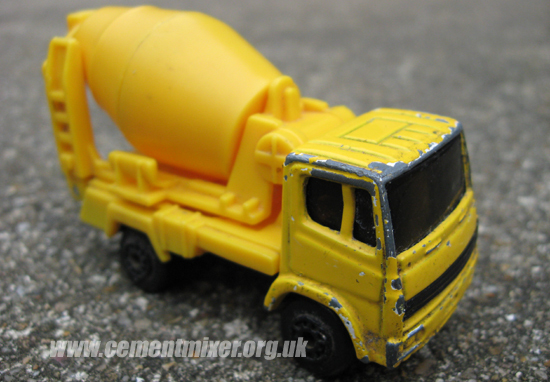 Be wary of the boxes as there are companies which manufacture near exact reproductions. 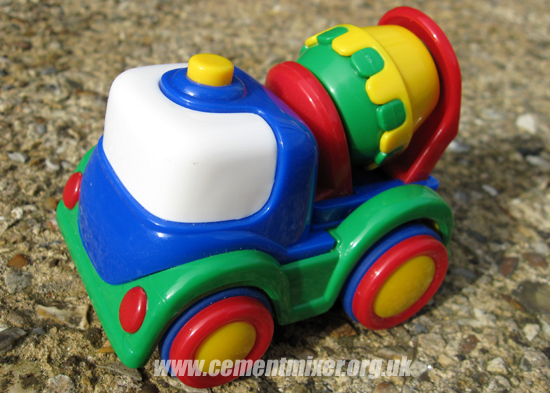 Its hard to say which of today's toy cement mixers will become tomorrow's collectable toys. But two toy makers do stand out. 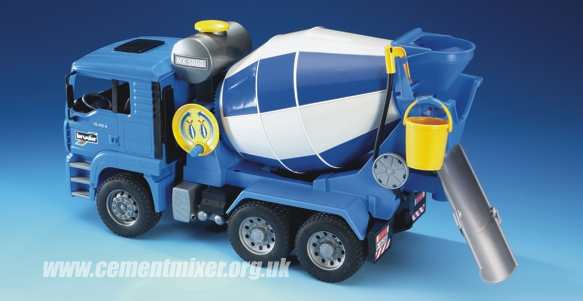 Britains and Bruder Toys combine realistic cement mixer features with good playability. 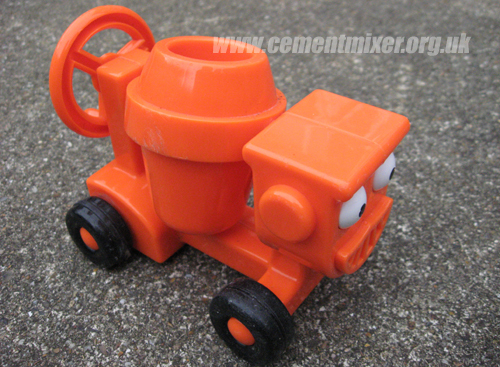 German company Bruder especially make robust, durable and very well designed cement mixer toys.